I like to think, ponder, consider. And sometimes I think more than I act, unfortunately. Acting without thinking? Oh, yes. I’m a redhead; I’ve been known to react a time or two without thinking. It seems thinking and acting are best when they’re joined; fused with a foundation of truth, they’re a powerful combination. More about that later, with my fifth favorite, a quote. I’m linking up with Susanne today for Friday’s Fave Five, my favorite exercise in being thankful. 1. Having lunch with my husband. This is one of the joys of summertime. It’s great when he comes home for lunch and I get to spend an extra hour or so with him. 2. Friends’ books! I have two friends launching books today. One is Heather Strickland, who has participated in Friday’s Fave Five. 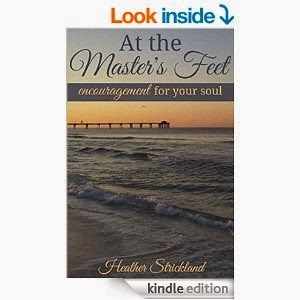 She has just finished a devotional book called At the Master’s Feet. It’s available for Kindle, on Amazon! 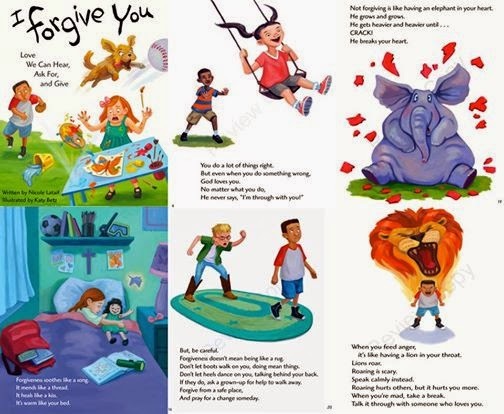 And a friend and former student, Nicole Lataif, has just released her second children’s book, I Forgive You: Love We Can Hear, Ask For, and Give. I love that concept—that forgiveness is love we can hear. Nicole’s book is charming and, most importantly, full of truth. Nicole's book is available in hardcover and for Kindle, on Amazon. 3. Lunch with friends. That’s what I’ll be doing today, and I’m looking forward to it! And on another note, although going back to school to teach has its down sides—like getting up earlier and bringing grading home—I’ll get to spend my lunch with friends from Monday to Friday. I’m thankful for my school buddies. “It was a bright, warm, still July night, a cool mist rose from the broad river, we could hear the splash of a fish, the birds were still, all was hushed and beautiful, everything praying to God” (Dostoevsky, Brothers Karamazov, 273). This is a great reminder for me as I plunge into more study. The melding of faith and thinking and acting upon God’s Word and promises is what it’s all about! All my thinking and reading are pretty much useless unless they have some connection to His Word and promises…and they do no one any good until they come to life in what I do every day. Wishing you time to think and act, with faith, this week. Laura, your faves always inspire me and have so much depth!!!!! Mine are so shallow!!!! I'm gonna checkout that devo book from the fellow blogger and yay for your former student!!! I just love BOTH quotes you posted. Many blessings as you head back to the classroom all while pursuing a PhD! I still have 5 weeks left and am savoring every moment. 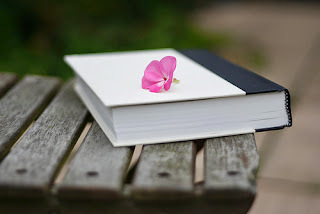 Wow, your paragraph: "All my thinking and reading are pretty much useless unless they have some connection to His Word and promises…and they do no one any good until they come to life in what I do every day" hit me between the eyes! I'm great at thinking up stuff ... putting into action, not so much. Have a great weekend and enjoy those lunch dates! Ooh well I tend to think a LOT and not act. I hate that...I'll think I should be doing something and I don't act on it. I lost my chance. And I definitely act without thinking first....heh, and I speak before thinking as well!! Glad you could sped extra time with your husband!! I agree with Jerralea that the quote about everything must have a connection to His Word or it does no one any good is exactly IT. How neat to have a friend and former student published! I just finished The Brothers K a few weeks ago and somehow missed that quote - thanks for bringing it out. I can't imagine working on a Doctorate on top of teaching full time. It will be a busy semester but hopefully a rich one as well. Love your last few paragraphs. That Tim Keller. I appreciate him more and more. I hope that you find rich treasures as you study and re-enter the teaching schedule. My husband and I are avid Kellerites- thanks for sharing the quote! We've been re-reading Counterfeit Gods this summer.